ensemble provides a better insight of the fireball properties. reactions and combustion processes are evidenced by the radical production within the plasmoid. applications ), and microwave enhanced combustion processes. before 35minutes they show some amazing high speed camera footage of sprites. Is it just me, or do sprites seem to enter the atmosphere like so many grains of meteors and travel down toward the planet? As opposed to them being an upward effect of lightning. I wonder if this is CME material actually bombarding our planet! The lightning is the material penetrating another, more inner layer of the electromagnetic shell and discharging with-in. Notice in the lowest image there are two circles, side by side. Above them is a circle in the center of the discharge pattern. Above and to the left are two more areas, side by side. Isn't this consistent with the flow of electrical force in a Birkeland current (in cross-section)? Two twisted pairs, becoming one just before becoming a single stream. What a gorgeous image. Thanks for posting the link. What have we been stating -- e.g. in the case of Venus -- regarding the possible surface reaction of N towards C by means of Fe as catalysator? Japanese scientists have now found the proof what lightnings can achieve in Earth's atmosphere. its no surprise that lightning produces light spectra in different wavelengths including gamma. How exactly did they measure the 0.511mev on the lightning bolts? seems like they just detected the gamma rays and filled in the blanks to get their money or whatever. Webbman wrote: its no surprise that lightning produces light spectra in different wavelengths including gamma. How exactly did they measure the 0.511mev on the lightning bolts? 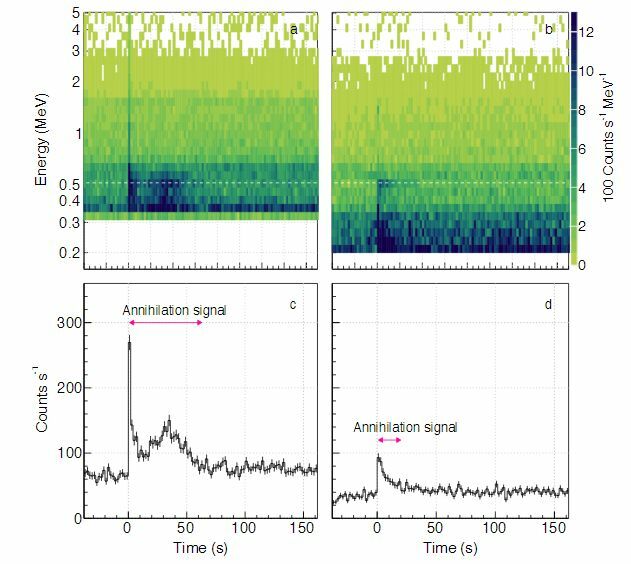 Count-rate histories during the annihilation signal. a, b, The gradient coloured maps show the detected counts in a unit time and energy (counts/s MeV) on the two-dimensional histograms of time (abscissa, 1-s binning) and energy (ordinate) for the detectors A (panel a) and D (b). The horizontal white dashed-line indicates 0.511 MeV. The dominant backgrounds above and below 3 MeV are cosmic-ray induced components and radiation from environmental radioactive nuclei, respectively. Gamma-ray spectra during the prolonged annihilation signal. Panels a and b are for the detectors A and D, respectively. The background is subtracted from the same time span of Fig. 2. The detector response is inclusive. The error bars are in ±1σ. See the panels c and d in Fig. 3 for the event-accumulating time regions for the detectors A and D, respectively. 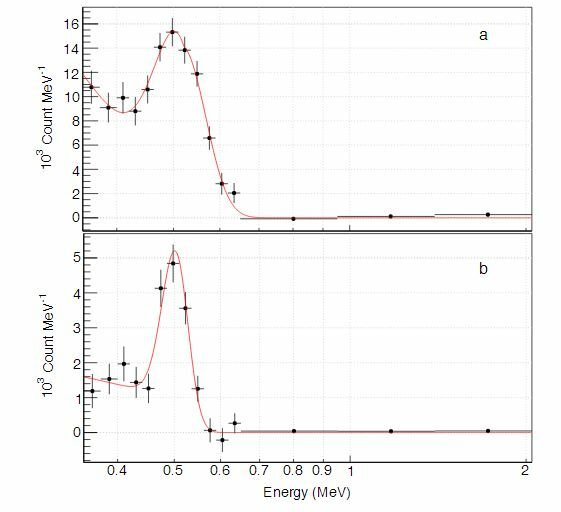 Red lines show the best-fitting empirical models consisting of a Gaussian line profile plus a power-law continuum, the latter of which represents the Compton scattering component from the former (see also Methods “Positrons and annihilation” for a physically-based model). did you ever think that an electron simply shape changes into a gamma emission and that no mythical positron is required? wouldn't that be the simplest explanation? Webbman wrote: did you ever think that an electron simply shape changes into a gamma emission and that no mythical positron is required? At Venus it seems that the Fe from the surface acts as intermediate as the CO interacts in the hot environment with water vapour and becomes CO2. Similar as it is used in steel industrie's coke plants for extracting Hydrogen from Water. That H dissipates into the Venus atmosphere and gets "lost" in space. B.t.w., that's why there's so many Deuterium in the Venusian atmosphere. Louis Kervran explained this about 100 years ago. I just linked that paper to demonstrate that there finally is now "scientific proof" of what has been clear for us all the time. The analysis of what really happens is another point. Me too thinks that the positron-explanition isn't the final word. Webbman wrote: It's no surprise that lightning produces light spectra in different wavelengths including gamma. Actually, this needs explaining. The only things that can vibrate fast enough to produce gamma rays are the protons within the nuclei of atoms. So gamma rays are evidence of nuclear reactions (fission and/or fusion), where the loss or gain of a proton disrupts the balance between the electric & strong nuclear forces within the nuclei, resulting in extremely rapid oscillations. Normally, electric currents, in solid conductors or in discharge channels through gases such as the atmosphere, don't generate gamma rays. There are a variety of types of emission mechanisms in lightning, including electron uptake, Bremsstrahlung and synchrotron radiation, etc. But none of those are gamma rays. 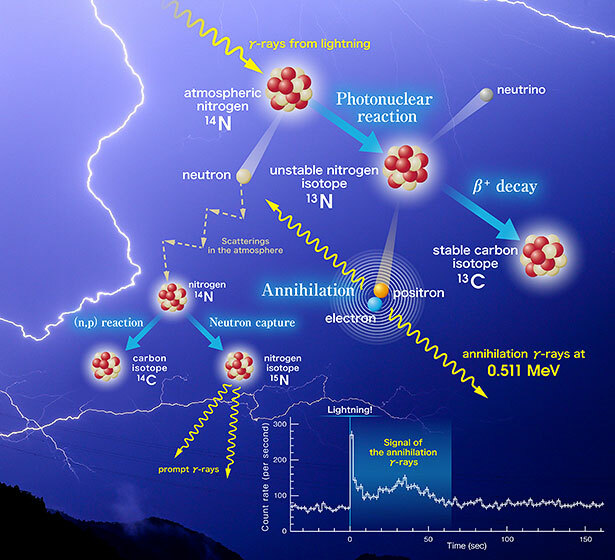 So something has to initiate nuclear events, before there will be gamma rays to initiate other nuclear events, such as the chain reactions described in the cited paper. The likeliest candidate for the first nuclear event is relativistic electrons slamming into stationary atomic nuclei at the ends of the stepped leaders. This will instantaneously create the temperatures and pressures necessary for nuclear events. Concentrations of fusion by-products, such as greater CNO abundances, as well as free neutrons (which decay within 15 minutes outside of an atomic nucleus), have been detected, here on Earth as well as after arc discharges on the surface of the Sun. Good morning. Has this discovery something to do with neutrino emission and oscilattions, alleged by mainstream science as a confirmation of core nuclear reactions? ConscioussNutshell wrote: Good morning. Has this discovery something to do with neutrino emission and oscilattions, alleged by mainstream science as a confirmation of core nuclear reactions?